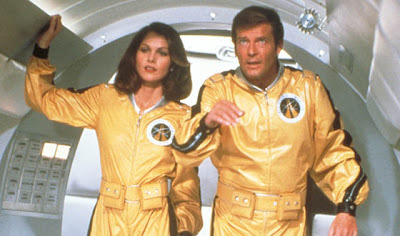 Following up the runaway success of The Spy Who Loved Me and attempting to infringe on the runaway success of Star Wars, the Bond producers literally shot for the stars with Moonraker. 007 investigates the disappearance of the Moonraker space shuttle, which takes him from California to Venice to Rio De Janeiro and, lamentably, to outer space. Moonraker's reputation as one of the worst Bond films belies the fact that much of it is rather good. The pre-titles sequence of Bond and Jaws battling while skydiving features some truly spectacular aerial photography. A second confrontation between Jaws and Bond on top of cable cars suspended high above Rio is just slightly less awesome. Roger Moore is at maximum swagger as 007. Unfortunately, the sheer excess on display rakes Moonraker over the coals. The winking self-parody is over the top, from Bond's outlandish gadgets, like his rocket-powered gondola on wheels in Venice, to the themes from Close Encounters of the Third Kind and The Magnificent Seven playing as gags. The villain Hugo Drax is as evil as he is boring and has the same basic "destroy the world and start humanity over" scheme as Stromberg in The Spy Who Loved Me, substituting living in outer space for living under the sea. The only thing exciting about Lois Chiles as Dr. Holly Goodhead her name, though just about every other Bond Girl in the movie is positively smashing. Everything set in outer space, from the laser gun battles to Jaws falling in love with one of Drax's space girls, is pretty much unforgivable. Unfortunately, that last half hour is Moonraker's legacy. In space, no one can hear 007 or audiences scream.